GM Lev Alburt. In the first volume of a two-volume dvd series devoted to the Benko Gambit, three-time US Chess Champion GM Lev Alburt examines and explains the fundamental strategic and tactical ideas associated with this sound and flexible defense to White's 1.d4. 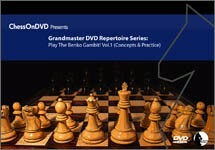 Grandmaster Repetoire DVD Series Benko Gambit Accepted by G.M. Lev Alburt Purchase Part 1 117 minutes GM Lev Alburt. In the first volume of a two-volume dvd series devoted to the Benko Gambit, three-time US Chess Champion GM Lev Alburt examines and explains the fundamental strategic and tactical ideas associated with this sound and flexible defense to White's 1.d4.